For the past couple of days I’ve seen reports about the “Occupy” movement reaching Harvard — how hundreds of protesters stormed the gates of Harvard Yard Wednesday night, how they were rebuffed by security forces who sealed off the Yard to everyone not possessing a Harvard i.d., but how the protesters with Harvard i.d.s eventually managed to erect a “tent city” next to the John Harvard statue in the Yard. For example, Boston Herald stories here and here; extensive Harvard Crimson coverage here, here, here, here, here, here, and here; and coverage in outlets as diverse as CBS, the local Fox TV, Big Government, Salon, Gawker, Adbusters, the Atlantic Wire, the Boston Globe, Wicked Local, BostInnovation, and The Stir. 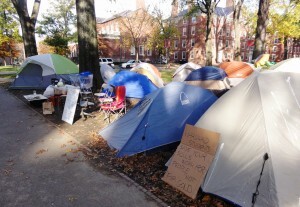 The people busily occupying space in Harvard Yard as part of the nationwide “Occupy” movement — given the language they’ve chosen for their movement, is it uncharitable to call them “space occupants”? 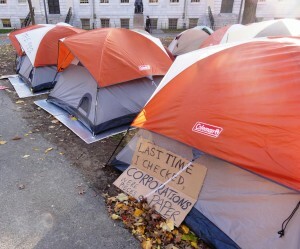 — even have their own website, OccupyHarvard.net. It’s registered to “Comms OH,” whoever/whatever that is. 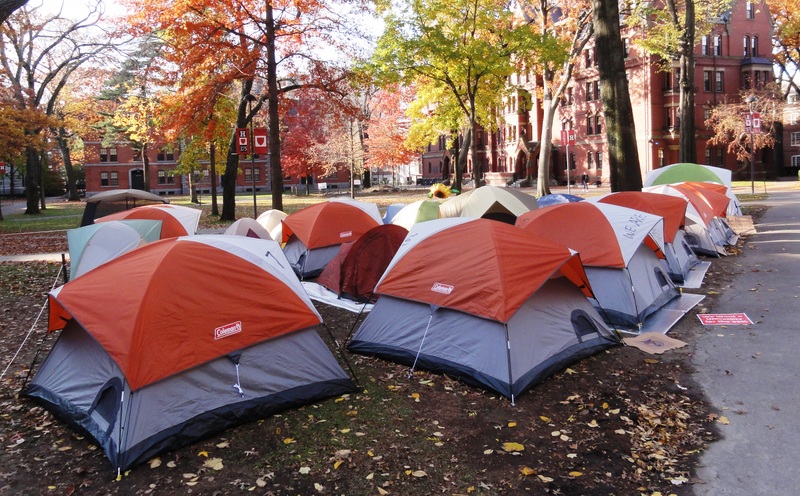 So let me get this straight: Harvard students are “occupying” the Yard to protest how the 1 percent keep the 99 percent in economic servitude. But the Crimson protest against capitalist oppression is by invitation only, and all the gates on campus have been locked, chained and padlocked to keep out the real 99 percent? 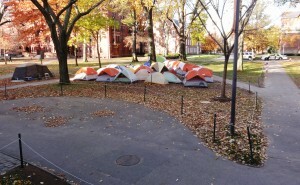 Occupy Harvard? It’s more like Occupy Gated Community. 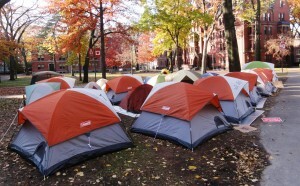 The pampered pukes are saying their faux encampment of Eddie Bauer and L.L. Bean tents is “symbolic.” It sure is — symbolic of the breathtaking hypocrisy of these limousine liberals. They’re in solidarity with the rabble . . . as long as the riff-raff stay on their side of the wall. 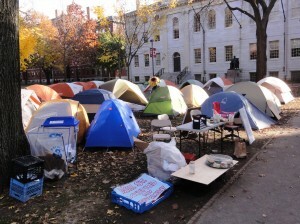 Occupy Harvard Yard is like when you were 6 years old, and you went camping . . . in your backyard, with your father. If you got scared, you could just run back in the house to get a hug from Mommy. 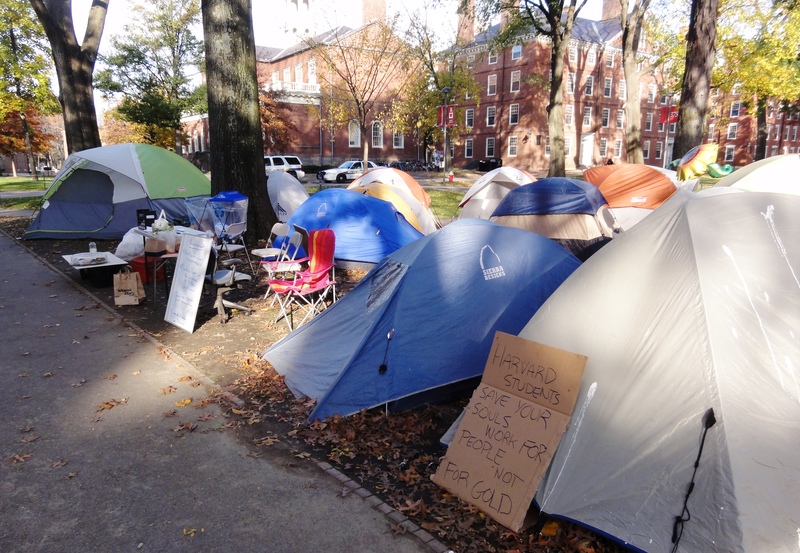 On the first morning of the encampment, the Harvard Crimson did a photo essay on how things were going on Day 1, which documented about half a dozen protesters on site at around 9 a.m. (here). So I wondered, how are things going on Day 3? 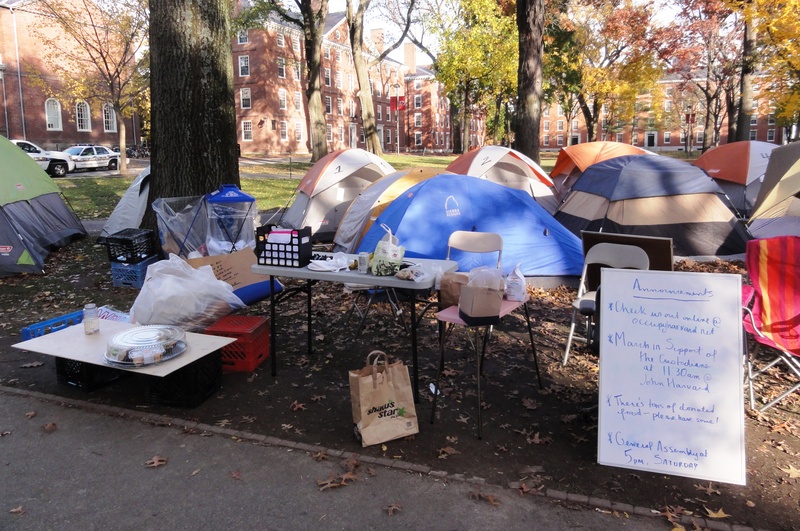 Especially on a day on which classes were not in session, so the members of the movement are able to devote their full attention to the encampment, would a larger contingent of space occupants be on site? Perhaps dozens of space occupants? As one of the fortunate few in possession of a Harvard i.d. (perhaps only 35,000 of the world’s 7 billion people have one, making me and the space occupants part of a privileged 0.000005%), I’m one of a handful of photobloggers in a position to report on the situation, so I felt a special obligation to do something to provide an update, especially given that Harvard’s current security policy bars members of the mainstream press from access to the Yard. I then walked around the entire encampment, clockwise, documenting its condition and the curious absence of space occupants. Final score at “Occupy Harvard,” Day 3: 2 photographers, 2 cops, 0 occupants. Update (11/13, 4 p.m.) — Much appreciation to Prof. Glenn Reynolds for the “Insta-launch“! And thanks to those who’ve taken the time to comment. This entry was posted on Saturday, November 12th, 2011 at 3:23 pm	and is filed under Uncategorized. You can follow any responses to this entry through the RSS 2.0 feed. You can leave a response, or trackback from your own site. I’m sorry. This mistake annoys me, and I see it everywhere. The word is not “peaked” or “peeked”. It is “piqued”, as in “this piques my interest”. Thanks — peaked changed to piqued. I’m chagrined that a Harvard affiliate — part of the 0.000005% — could make this mistake! I’ll bet the irony of this is lost on the people who set up those tents. btw, you have typo in your post. That’s space cadets, not space occupants. SteveP, surely I don’t mind if, when people read “Space Occupants,” they think “space cadets,” but the point of the blog title is to stay faithful to the language they’ve chosen to describe their own movement! Clockwise? The opposite of widdershins is deasil. Nice tents… Sierra Designs and Colemans. No classes? Maybe they were all just sleeping in. Did you peek inside of any of the tents? 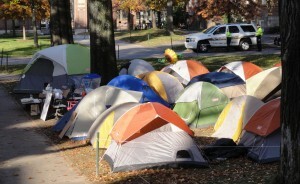 What’s with the row of orange/white Coleman tents? Is that a rental standard? An overstock sale? 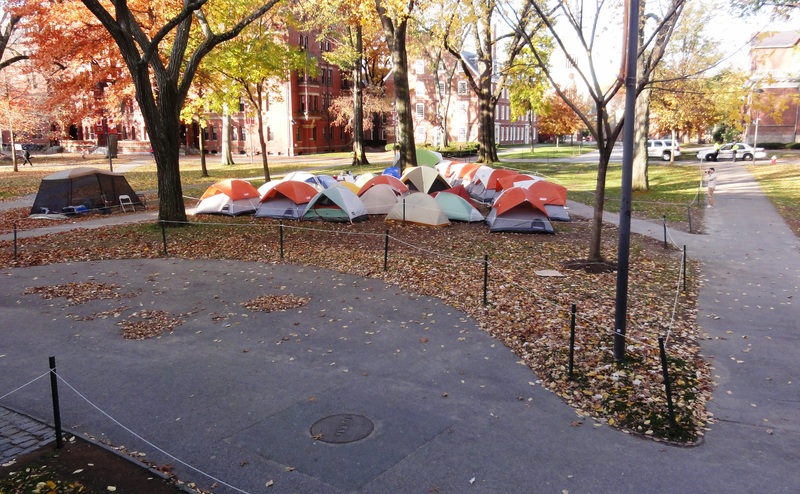 Most campsites I’ve camped at are not as nice as Harvard Yard. I wasn’t aware I was making a political statement every year I went camping with my kids. They when to Starbucks. They’ll be back once the weather warms or after spring break. 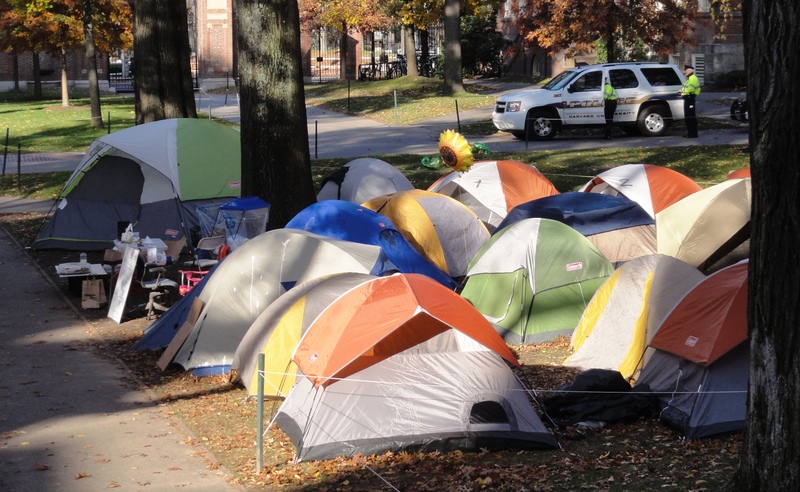 The row of identical new-looking Coleman tents strongly suggests that this “protest” started with a trip to the sporting goods store with daddy’s credit card. Pathetic. I’m unfamiliar with tent manufacturers — if there are any tent fanatics out there, perhaps someone could list the tent types being used and even include links to the manufacturer websites. With that information I’d be happy to do a post categorizing the various tents and totaling up the cost. Note: I just amended the main post to add this paragraph at the end of the block quote of Howie Carr. Are you saying that when you were there, you saw *no one*, just empty tents? if so, on what basis do the Occupiers feel they have a right to pitch tents? Maybe this was just a clever way to advertise for Coleman tents. Corporations may be just pieces of paper but they can also make some mighty fine outdoor gear. But for the miniscule size, I might think this a Christo installation. Great piece, thanks. Brings a whole new connotation to the word “occupied”. I have to ask…..are those dog doors on the tents in photos 6, 7 and 8? I’ve never seen zippered flaps so small – but wouldn’t doubt if Crimson tents might have them. Makes me wonder if there are flat-screen TV’s, microwaves and Lazy Boys inside too! In photos 2 & 4, you can see numbers on the tents. They’re either checked out from recreation services or they’re rentals. 1. No, I neither saw nor heard anyone anywhere near, nor in, the tents, despite spending at least five minutes walking around the “encampment” looking, listening, and taking photos. I even spoke with one of the police officers; he was quite diplomatic and didn’t say anything negative about the occupiers, but when I asked him point blank whether he was positive that at least one person was in the tents, he said no. Note that at least one of the photos shows a table and half a dozen chairs. That’s where the half dozen or so people on Day 1 depicted in the Crimson photos were sitting, and it’s the logical place one would have people available to talk to passersby if the camp were occupied at that time. 2. As to whether the “Occupiers” feel it’s okay to pitch these tents and pretty much abandon the place, at least when they prefer to be doing something else, while everyone who wants access to the Yard is inconvenienced by the gate access policy triggered by the presence of tents that might attract the criminal element found at other Occupy sites, I’ve heard from a friend of mine who’s peripherally involved in the movement that interest in actually occupying the site (particularly when it’s cold) is diminishing so quickly that the “Occupiers” plan to dismantle the campsite by Wednesday because they can’t get enough commitments from enough people to sustain it much beyond that. Obviously, if and when they do that it will be pretty obvious that the occupation was a total failure, but apparently they plan to time the dismantling around a “victory” they’ll claim when the Harvard janitors conclude a new contract on Tuesday, even though obviously the occupation has nothing to do with what contract terms the janitors end up winning. You heard it here first! If matters do turn out this way, the “Occupy Harvard” project will turn out to be a net setback for the nationwide “Occupy” movement — the attention attracted by occupying Harvard hardly seems like a plus for occupiers if the occupation fails. Last time I checked, Coleman was a corporation. Which of them bought (and by that I mean which student’s parents) sprung for all of the matching tents? Or did they all go together to REI (also a corporation) and clean them out of tents (with rain covers)? Coleman 6-man tents for $46.96 at amazon. Add in the insulating mats and sleeping bags and let’s say it’s $100 per tent unit. Call me crazy, but most of the real 99% can’t/won’t drop $100 on a whim for a brand new tent and gear, and then not even use it. 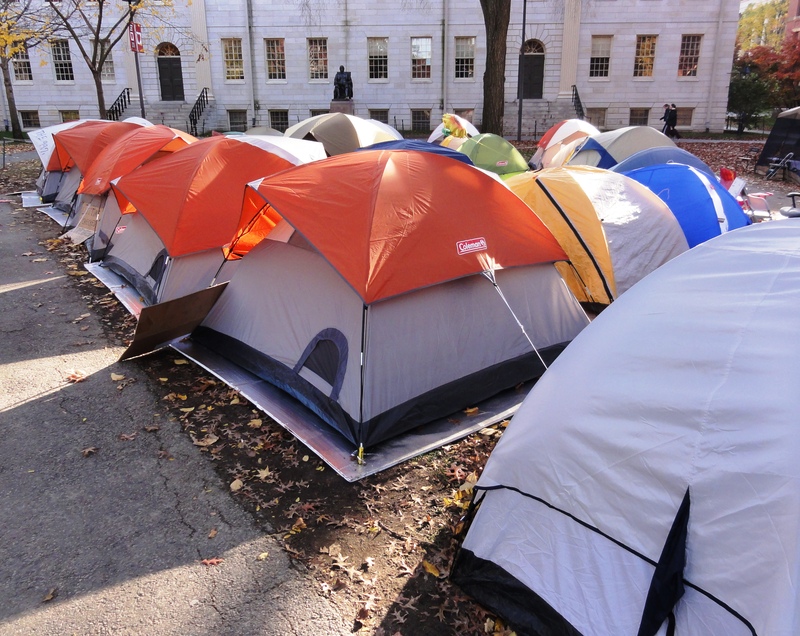 When this fad passes, will they donate these tents to charity or just throw them out? wow, they’re really roughing it and living like the 99%. I want to thank you for your blog and the pictures because it really highlights the need for those students that do care about Occupy’s key themes – an economic system that leads to rising inequality and a political system that sustains it – and how Harvard contributes to, or helps combat this, through its own employment and investment policies as well as its teaching and research, to get involved. Personally, I took part in the rally/march which had about 600-800 people present, 90% of which were Harvard affiliates. I’ve also slept out twice so far, and intend to do so again. On average so far about twenty five people have been sleeping out on a nightly basis, including one freshman who’s slept out every night. I was brought up in an evangelical tradition which taught the importance of “bearing witness” even if you were in small minority i.e. “where two or three are gathered in my name”. So small numbers do not necessarily undermine the validity of a protest in my view. Indeed Bishop Gene Robinson spoke last week of driving through New Hampshire and being deeply moved by seeing a single young person on a metal folding chair holding up the sign “Occupy Sunnabee”. But thanks for coming over, and I hope next time you come there will be someone there you can actually talk to. I think you will find we are a pretty reasonable and sincere bunch of people who simply believe that doing and saying something, rather than remaining passive, is better when confronted with injustice. Why are they protesting?….. they ARE the star-bellied sneetches! What a joke, specially “Adam”! Can’t you see you are one of the less than 1% elite? What ordinary person from a small town has a snowball’s chance of having the type of education that would lead to a place at Harvard? If you were even 1% honest, you would give up your place there to a more deserving poorer person!! All of you lib hypocrites with your mealy- mouthed double-speak!! PS, what jobs do your parents do and how much do they earn?? Typical leftist symbolic idiocy, protest tents with nobody actually in them. It reminds me of a leftie “hunger strike” they had once in the past. About 24 people took turns “hunger striking” by not eating in 2 hr rotating shifts. When it ended, the MSM was surprised that none of the “hunger strikers” had lost any weight. We have yet to see a single OWS accomplishment other than a rolling crime wave, filth, rambling nonsense, and the disgust of most everyone who is unfortunate enough to encounter them. They have not helped the community in any way. They do not get along well with anyone outside their movement, much less each other. They are destroying every place they are encamped. They do nothing positive for anyone. 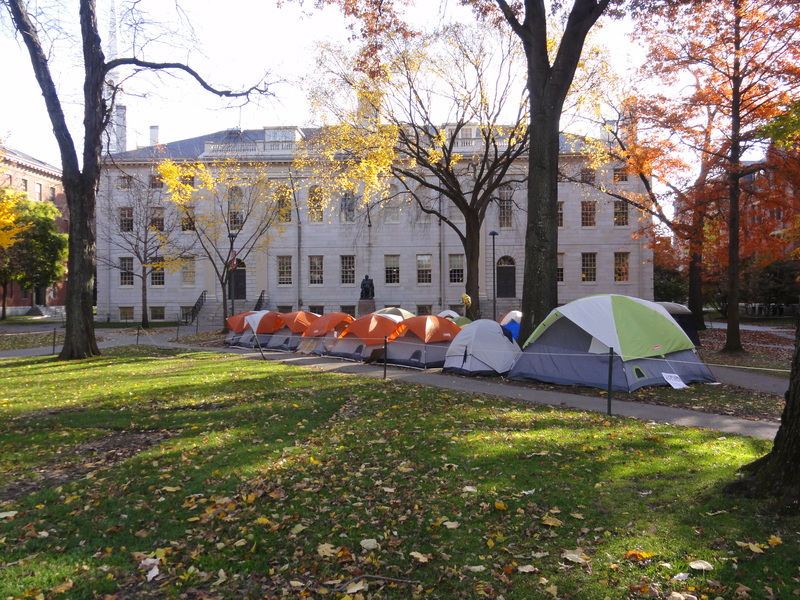 In response to juniper, many of the students involved in Occupy Harvard that I know come from ordinary middle class or working class backgrounds. This reflects the fact that Harvard’s financial aid policies are generally more progressive than many universities, the result of campaigning by an earlier generation of students. That said, students from wealthier backgrounds are still disproportionately represented partly as a result of Harvard’s legacy preference policy which obviously disadvantages those whose parents are not alums. My own father worked twenty five years as a coalminer. I guess that qualifies him as a member of the 99% but I’ll let you be the judge of that. These students are in Harvard for its elitism. Otherwise, they would have applied elsewhere like state schools. They should be profiled for hypocrisy. Photo 7 is really funny, but it’s so true! Weblogs at Harvard - Powered by WordPress & designed by Tom.